White Knight provides comprehensive training for all employees and distributors who service pumps. We also offer training programs and certifications for technicians of customers who prefer to service their products in the field. White Knight staff offer a two-day training program to certify your technicians to rebuild White Knight pumps. Certifications are valid for two years. Parts in pumps that are rebuilt by certified technicians receive a full warranty (e.g. one or two years, depending on model). Training sessions take place at our facility, unless prior arrangements are made with White Knight. Use the form below to request training. Complete the form below to request pump rebuild training. Note: Fees apply. Customer support will contact you with available training dates. Quote will be sent based on details you provided. A request does not guarantee a scheduled training. Complete form to enable Submit button. Correct email to enable Submit button. Our training board continuously develops and oversees long-term training systems to benefit our employees, customers and shareholders. These thorough training systems ensure our employees have the ability to perform their duties as efficiently and as safely as possible, and they guarantee our products are manufactured by a skilled, confident and competent workforce. Further, the company also invests in its employees through tuition reimbursement programs, which improve employee morale, reduce turnover, and result in more knowledgeable, better-skilled employees who create great products year after year. White Knight manufactures high-purity fluid handling equipment for semiconductor, solar, LEDs, flat-panel displays and electronics industries. We ensure quality through controlled in-house engineering and manufacturing. 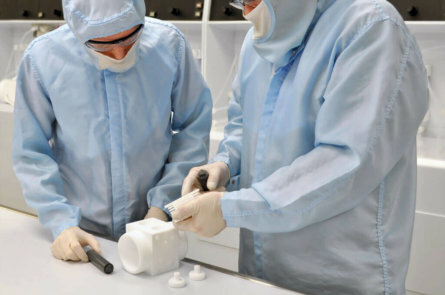 We assemble, test and package high-purity products in a Class 100 cleanroom. White Knight is committed to meet your complex fluid handling needs. Our pumps are thoroughly tested and perform reliably in the most demanding applications and in the harshest environments. Our engineers are ready to set up your custom tests at our facilities, or you can order a demo unit to test in your own system.